Manufactured by Jag Mobile Solutions®, our Preferred Series Restroom Trailers set the standard for premium comfort and convenience. When your event calls for that discerning level of service in temporary facilities, Call Orange County Potty's at 407-509-3565. Continually evolving to meet today's demands, Orange County Pottys is proud to now offer our Preferred Series Restroom Trailers. Our units are designed to look upscale and contemporary, and are engineered to meet the needs of discerning customers. The OCP Preferred Series offers features like air conditioning, hot and cold running water, waterless urinals, stainless steel sinks, mirror, solid surface counters, contemporary flooring & wall surfaces, full privacy stall enclosures and comes fully stocked/re-serviced with paper and hand cleanser products. 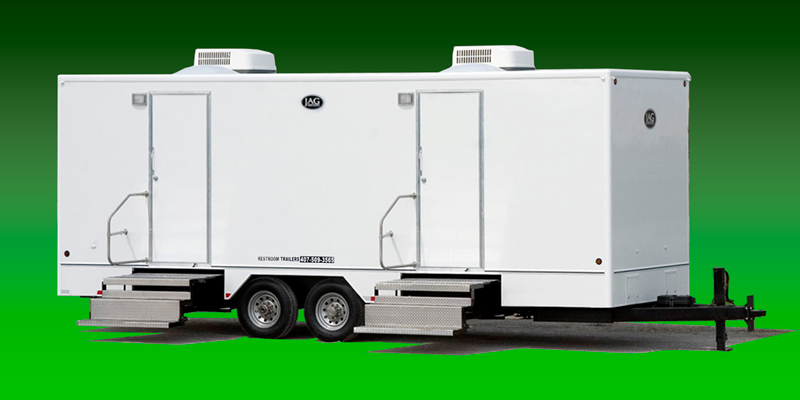 Our Preferred Series Restroom Trailers are ideal for use at office, school, and restaurant re-model. They're also great for weddings, festivals, concerts and other high-traffic events. When your event calls for that discerning level of service in temporary facilities, Call Orange County Potty's at 407-509-3565.